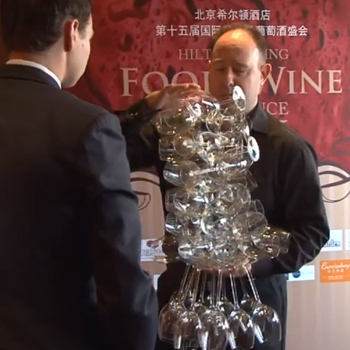 (Scroll down for video) A man broke a world record by holding 51 wine glasses at once, according to the Guinness World Record. A British man on Saturday broke the world record for the number of glasses of wine in one hand, according to event organizers. He managed to hold 51 glasses to exceed the previous record of 39. Philip Osenton, a wine consultant of 43 years old, based in Beijing, began managing dozens of glasses at once early in his career working in major hotels in London Ritz and the Savoy, which laid this foundation for the feat. "Transporting sommelier glasses is one thing. While he was head sommelier at the Ritz hotel, I had a 140 capacity restaurant to cover in the morning, between breakfast and lunch, so basically with two vessels he had managed to fit 280 glasses with a very short amount of time," Osenton told the news media. "There is a lot of pressure to get the room ready." In his first attempt Osenton obtained 45 glasses at once, but he did it 51 in a second attempt, clasping his hand with glasses on top of each other in the left hand.